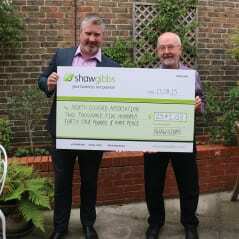 Shaw Gibbs has raised an impressive £2,541 for its Charity of the Year, North Oxford Association. The funds, which were presented to the charity by Shaw Gibbs Managing Director Peter O’Connell, have been raised over the last twelve months from an array of activities organised by Shaw Gibbs employees. The charity, which is run entirely by volunteers, has a number of ideas on how best to use the funds, including creating a play area for children and an automatic gate to help manage the small car park. “This support couldn’t come at a better time. We try to offer as much as we can for all ages in our local community, but expenses are hefty. This money is a great help and will make a tangible difference,” adds David Potts. One of the major fundraising events was the Shaw Gibbs Annual Rush Hockey Tournament. Over 160 people from professional firms in Oxfordshire took part, raising £800 for the charity. More activities during the year included Dress Down Fridays for a donation of £3 and regularly auctioning off the Shaw Gibbs reception flowers. North Oxford Association was established in 1966 and operates from a community building in Diamond Place, Summertown. A popular ‘drop in centre’ for North Oxford, activities include a Neighbourly Help scheme for the elderly or disabled and a befriending service. It also runs language classes, yoga and other exercise classes, health walks, bridge groups, mother & baby groups, and training for babysitters. New volunteers are always welcome. For more information about how North Oxford Association visit northoxfordassociation.co.uk, call 01865 552295 or email info@northoxfordassociation.org.uk.